Research long suggested infection to be a cause or to promote atherosclerosis. This idea is supported by many reports and epidemiological studies (1). However, main trials using antibiotics have failed to prove their protective effects in secondary prevention of coronary artery disease (2). Periodontal disease, one of the most common chronic bacterial infection, may represent a favorable scenario to verify the connection of infection and atherosclerosis/cardiovascular disease. The first researchers to indicate a relationship between oral infections and atherosclerosis were Mattila and colleagues. In their study published in 1989 they have identified periodontal disease as an independent predictor of elevated risk of myocardial infarction (3). Several studies are suggesting an oral source for atherosclerotic plaque - associated bacteria with demonstration about the presence of viable periodontal pathogens in atherosclerotic plaques (4, 5, 6, 7). In this regard an interesting hypothesis was proposed in 2004 that periodontal infection may lead to brief episodes of bacteremia with inoculation of atherosclerotic plaque by periodontal pathogens such as Porphyromonas gingivalis, Actinobacillus actinomycetemcomitants and Tannerela forsythensis (8). Related to the subject a recent review says that clinical procedures by dentists on the teeth and periodontal, along with the daily brush made by patients, produce a transient bacteremia, which may cause a secondary infection in a distant tissue or organ, including arteries. For the authors of this review it is evident that both endodontic surgical procedures and non-surgical instrumentation of root channels during endodontia can produce a transient bacteremia. Also, they have stressed that a tooth extraction causes bacteremia in 100% of times (9). Coincidently to the present matter a study published last month revealed data from Medicaid patients showing that the risk of adverse vascular events sharply increases in the month following invasive dental treatment and then gradually returns to normal over six months (10). However, an important information is generally left aside by investigators studying the connection between oral infection and atherosclerosis/cardiovascular disease. These investigators don’t take in consideration that the sympathetic nervous system is intensely activated during bacteremia. This was demonstrated by studies showing that the sympathetic tone rapidly increases after the experimental injection or infusion of bacteria and similarly during bacteremia in humans (11, 12, 13, 14). 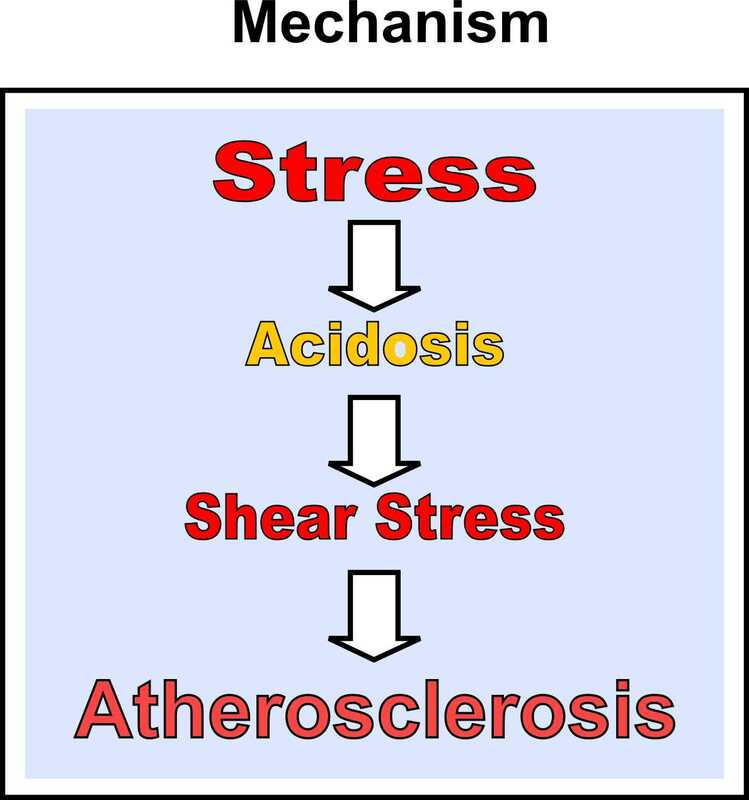 In the acidity theory of atherosclerosis point of view the sympathetic predominance is the primary factor in the cascade of events leading to the atherogenic spiraling. Therefore, we think infection through bacteremia can be added to the long list of risk factors for atherosclerosis/cardiovascular disease, as mentioned in the acidity theory paper and in other previous articles published in this blog (17). 3. Mattila K, Nieminen MS, Valtonen VV, et al. Association between dental health and acute myocardial infarction. Br Med J 1989;298:779–82. 11. Palsson J, Ricksten SE, Delle M, Lundin S. Changes in renal sympathetic nerve activity during experimental septic and endotoxin shock in conscious rats. Circ Shock 1988; 24:13341. 12. Jones SB, Kovarik MF, Romano FD. Cardiac and splenic norepinephrine turnover during septic peritonitis. Am J Physiol 1986; 250:R8927. 13. Leinhardt DJ, Arnold J, Shipley KA, Mughal MM, Little RA, Irving MH. Plasma NE concentrations do not accurately reflect sympathetic nervous system activity in human sepsis. Am J Physiol 1993; 265:E2848. 14. Straub RH, Pongratz G, Weidler C, Linde HJ, Kirschning CJ, Glück T, Schölmerich J, Falk W. Ablation of the sympathetic nervous system decreases gram-negative and increases gram-positive bacterial dissemination: key roles for tumor necrosis factor/phagocytes and interleukin-4/lymphocytes. Infect Dis. 2005 Aug 15;192(4):560-72. 16. Okada Y, Hamada N, Kim Y, Takahashi Y, Sasaguri K, Ozono S, Sato S. Blockade of sympathetic b-receptors inhibits Porphyromonas gingivalis-induced alveolar bone loss in an experimental rat periodontitis model. Arch Oral Biol. 2010 Jul;55(7):502-8.